According to the latest print issue of the Irish music mag Hot Press, members of the Cranberries are “to be confirmed” to speak at a music seminar in Limerick on April 10th targeted at small independent bands. The seminar will cover basic “do it yourself” topics for indie bands like recording, promoting, and touring. Doors open at 12 noon for the seminar and tickets are only €5. Also of interest to Cranberries fans, former Cranberry Saw Us singer Niall Quinn will be performing with his band The Pennywhores at Dolan’s on the same day. The Pennywhores are part of a “Vibe for Kurt” Nirvana tribute concert to take place at 8 o’clock that night. Ticket prices are still undetermined. Update 04.01: The Pennywhores will no longer be playing at Dolan’s on April 10th. However, Niall Quinn tells us that he will still be attending the seminar. Thanks to Des for the info! Dolores O’Riordan and husband Don Burton made the front cover of nearly every Irish tabloid today as the second day rolls on in a civil lawsuit brought by former childcare provider Joy Fahy, who was a childsitter for the couple’s son Taylor in June 1999. Fahy is alleging that the couple broke a verbal agreement made by Don Burton for a salary of £500 a week plus £40 for expenses. She is seeking compensation of £10,000, a Jeep that she claims was promised to her, and the return of her personal possessions. The biggest testimony yesterday by the prosecution was that on a June 28, 1999, a drunken Don Burton took 18-month-old Taylor onto a jetski without a lifejacket. Fahy elsewhere claimed that she was more concerned when Taylor was in the care of his parents than in her own hands. A surprise piece of evidence today from the defense shows that Fahy illegitimately received approximately €3,000 in “dole” unemployment payments from Ireland’s Deptment of Social Welfare while she was working in London for actress Elle MacPherson. A shocked Fahy responded by saying, “Oh my God,” and that she had no idea that she was still receiving payments, since they were deposited directly to her bank account. She acknowledges that she is still “in the process of sorting out her a airs” and that she will have to return the illegitimate payments to the government. Also today, Fahy broke down in court when testifying that she never got a chance to say goodbye to Taylor Burton, to whom she had grown quite attached. “It stays with her that she wasn’t able to turn around in Canada and say goodbye to the little guy,” commented Wilson. Fahy told RTÉ News that she became a professional childsitter after an accident in 1994 which halted her career in physical fitness. After a subsequent depression, Fahy said the she had a chance to re-evaluate her life. It was at that time that she became a childcare provider. She has had numerous celebrity clients, including U2’s Larry Mullen, Jr. The case will be continued on Tuesday. This morning’s Irish tabloids featured numerous front-page stories regarding the ongoing lawsuit between former childsitter Joy Faye and Dolores O’Riordan-Burton. The tabloid reports contain many of the more saucy details that national outlets like RTE tactfully omitted. Below are some text versions of articles that appeared today. You can check out some great scans over in the Magazines Gallery that include some very nice color photos of Dolores and Don walking to the High Court in Dublin. Thanks to Des for sending in the scans! 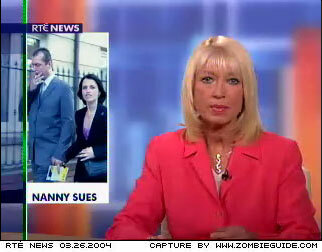 CRANBERRIES rock star Dolores O’Riordan’s husband falsely imprisoned their nanny, a court heard yesterday. Joy Fahy, 34, claimed she locked herself in her bedroom as she fled in fear from the singer’s Canadian partner Donald Burton. He roared at her in a drink-fuelled rage after she disagreed with the way the couple’s child Taylor was being treated in Canada in 1999, the court was told. Ms Fahy is suing the couple for false imprisonment and breach of contract. She wants EUR12,500, a Cherokee Jeep and a deposit for an apartment because she claims they reneged on an agreement they had. BURTON was persistently drunk in the afternoons and evenings, and – HE took the couple’s child on a jet ski without a lifejacket. Ms Fahy travelled to Canada in June 1999 with the couple where she claimed they stayed in an isolated building eight miles from the nearest village. She claimed the row with O’Riordan and Burton started after she was told to live in the house without a car, which had no food, only an out-of-date tin of pasta. Ms Fahy told O’Riordan she was unhappy with the situation and the way their baby was being treated. The nanny, who also worked for U2’s Larry Mullen, said: ” O’Riordan went ballistic. She was screaming and crying. Soon after Burton, who had been drinking with friends, came upstairs and challenged Ms Fahy. She claimed: “He began to shout. There was a lot of cursing. “He had been drinking. His face was red, his eyes were bloodshot, he clenched his fists. She then claimed to have locked herself in her bedroom and put her suitcase against the door. 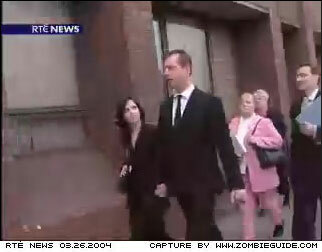 Ms Fahy’s lawyer said: “She became afraid and distressed and Burton continued to be aggressive and abusive. O’Riordan and Burton, who live at Riverfield Stud in Kilmallock, Co Limerick, strongly deny the claims. Ms Fahy, of Moyleggan in Co Meath, said she had no bad words to say about O’Riordan’s mother Eileen and that her daughter’s behaviour had been exemplary. 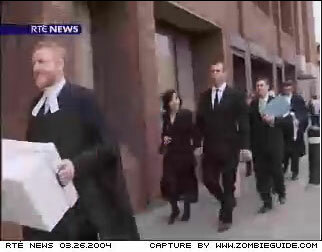 The court heard that when she flew home from Canada to Ireland on July 2, 1999, she cried all the way home. Ms Fahy has also asked the court for an order to have her personal belongings, which she alleges have been kept by the couple, handed back to her. She claims to have had a verbal agreement with the couple to employ her in 1999 as a full-time childminder. Ms Fahy said she was to be paid IREUR500 (pounds 630) a week plus pounds 40 a day expenses when she was travelling with them. She also said she was to get a new Cherokee Jeep and that they would provide her with facilities for her horse at their stud farm along with accommodation. Ms Fahy claimed she was o ered the job because her work as a nanny to the children of other celebrities had been commended and she started work on June 1, 1999. But she alleged problems began straight away. She had to buy her own meals, had no mobile phone and claimed Burton took her passport and tried to get her to drink. The court heard he became infuriated when she refused and he was constantly drinking in the afternoons and evenings. Mr Bill Shipsey SC, for O’Riordan and Burton, said they disputed the alleged terms of the contract under which Ms Fahy was employed. They would be contending she had decided to leave her employment and had let the defendants down. It would be the defence case that Ms Fahy “walked out”. Ms Fahy’s lawyer Mr Richard Keane SC, said she was a maternity nurse who had been involved in looking after children from an early age. The court heard she had worked for some famous people in the rock music industry. Mr Keane said O’Riordan and Burton had asked her to come and work for them at a time she was involved with another high profile family in Dublin and was much in demand by celebrities because of her reputation. He added she was approached by Burton in June 1997 and her experience of working for him then was very unsatisfactory. As a result she terminated her employment and returned to Ireland to resume employment with another high profile employer in 1998. On February 27, 1998, Ms Fahy was contacted by Burton again to look after their baby. The court heard she thought it was a bit of a joke after what had happened before and refused. Mr Keane said Burton promised her the “sun, moon and the stars” and o ered her a new BMW. Ms Fahy replied she would like a jeep. He added Burton had asked her what she was being paid and had said no matter what it was, he would beat it. 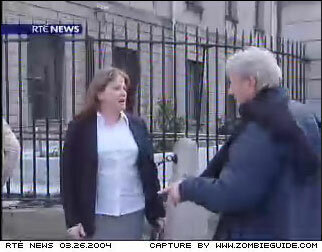 On March 12, 1998, Ms Fahy was in New York when she received four phone calls from Burton and she alleged he was drunk. Mr Keane told the court his client felt very vulnerable when dealing with Burton and he had tried to lure her from her employment. He claimed that on March 22, 1998, Burton again called Ms Fahy and o ered her a new Jeep, pounds 500, a 50-hour working week and pounds 40 per day while on tour. Burton also o ered to pay the insurance and tax on the vehicle. He told Ms Fahy O’Riordan was about to embark on a world tour. Ms Fahy decided the o er was too good to reject but was concerned because of what had occurred previously and decided to get safeguards built in to the deal. She claimed that if the contract was terminated, she was to receive a pounds 10,000 (EUR13,000) lump sum, a new Jeep and a deposit for the rent of a house or apartment. A woman who worked as a childminder for the Cranberries singer Dolores O’Riordan-Burton and her husband, Donald Burton, has brought High Court proceedings against the couple. Ms Joy Fahy, who previously also worked as a childminder for U2 drummer Larry Mullen, is suing the Burtons, who live at Riverfield Stud, Kilmallock, Co Limerick, claiming breach of contract and false imprisonment arising from her employment with the couple as childminder for their son from June 1999. Ms Fahy said she had worked with the couple previously in 1997 but left because problems arose. She later agreed to return to work for them in June 1999 after being o ered the “sun, moon and stars” by Mr Burton. However, she claims, problems arose from the start of her employment in June 1999, including problems while the couple were touring Canada and the US. She claims she barricaded herself in a bedroom on one occasion because of Mr Burton’s aggressive behaviour, and further alleges he was perpetually drunk in the afternoons and evenings. Ms Fahy (34) of Moyleggan, Batterstown, Co Meath, is seeking an order that personal belongings including designer clothing such as Dolce & Gabbana jackets, which she alleges have been retained by the Burtons, be returned to her. She is also looking for payment of IR£ 10,000 (E12,700), which she says was agreed in the event of termination of her verbal contract, and an order requiring the Burtons to provide her with a Cherokee jeep and a deposit for an apartment. Mr Bill Shipsey SC, for the defendants, said they were vehemently disputing the alleged terms of the contract under which Ms Fahy was employed. 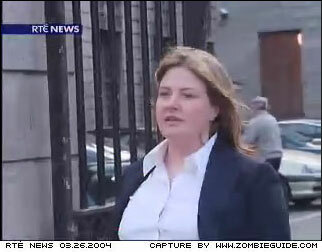 They would be contending that Ms Fahy had let the defendants down and “walked out” on them. Ms Fahy alleges she was to be paid IR£ 500 (E635) weekly plus IR£ 40 (E50) per day in expenses when she was travelling with the Burtons. She also claims she was to be provided with a new Cherokee jeep, facilities for her horse at the couple’s stud and accommodation near their home. Mr Richard Keane SC, for Ms Fahy, told the High Court there was no criticism of the O’Riordan family, and Ms Fahy had received great support from Ms Eileen O’Riordan, the singer’s mother. 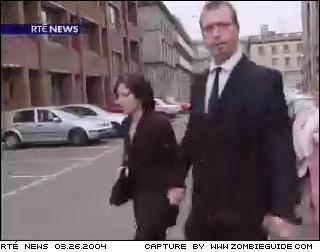 During a trip to Canada in 1999 with Cranberries singer Dolores O’Riordan and her husband Don Burton, Mr Burton’s behaviour deteriorated, he seemed to be drinking daily and was quite aggressive, the couple’s former childminder told the High Court in Dublin. Ms Joy Fahy said they were accompanied to Canada by Dolores’s mother, Ms Eileen O’Riordan, and stayed in a house in a remote area by a lake. Ms Fahy said Mr Burton drank at all times of the day with friends, played loud music and played with his “toys”. The couple brought their child with them on quad-cycles and jet-skis, which was not safe or normal, she added. The former childminder has taken a High Court action against the couple alleging breach of contract and false imprisonment. She said the baby’s sleeping arrangements became a big issue and on one occasion Dolores handed her the sleeping child and asked that it be given a warm bath. Ms Fahy said she was unhappy about doing this and the child became upset and wanted to go back to sleep. Dolores was upset and said the child would be up early the next morning. Ms Fahy said she complained about being left on her own with the child in a remote area. She had been told that the Burtons and Eileen O’Riordan would be returning to Ireland. He told her he hired and fired and they (Dolores and he) decided whether she could go or stay. He added that she (Ms Fahy) had a problem getting on with people and from the start had “this haughty attitude”. She said he told her she was fired, and would get her passport when he felt she should. Ms Fahy said she locked herself in her bedroom by putting a suitcase to the door. Eileen O’Riordan came and asked how she was, and said not to come downstairs because Mr Burton was very angry. Later, when he had calmed down, he came to her room and threw her passport across the room. When Ms Fahy came back to Ireland with Eileen O’Riordan, she learned she was not to be allowed into the house at Kilmallock. It took three weeks to get her belongings in refuse sacks. Earlier, she said she worked with the couple first in 1997. When in Canada with them, the first few days were okay but there was never any structure to the day and she did not know when she was o or on. It was strange and they were in an isolated house which was not well equipped for a new baby. She was in a very dark and small bedroom. During a trip to New York, Mr Burton told her she could go home to Ireland as she was not needed. She was upset. All her belongings were in Canada and she had only gone to New York on vacation. She had no money and no mobile phone. She had sold her car and given up her apartment. She arrived back in Ireland with nothing, and stayed with friends. She had not been paid and had no money. Eventually a friend brought home her belongings from Canada. After about a month, money was lodged to her bank account in Ireland. She was later approached by the family of Anne Acheson (wife of U2 star Larry Mullen) and started work with them in 1998. That was a fantastic job and the family and children were fantastic. In February 1999, she got a call from Mr Burton asking her to work for him again. Ms Fahy said she did not entertain the idea. He later o ered her perks, such as a lump sum of £ 10,000 on termination and assured her she would have a deposit on an apartment. Her remuneration was to be £ 500 net and she would work general nanny’s hours, 50 hours a week. It was an oral contract even though it was her intention to have it in writing. She never got a written contract despite asking about it. The hearing continues. 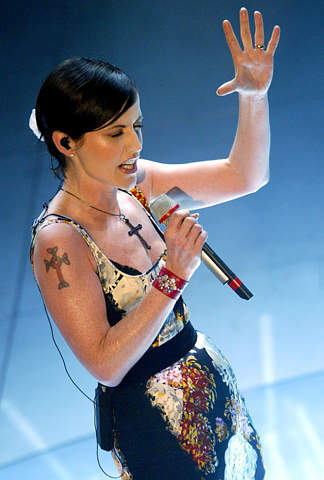 THE extraordinary lifestyle of a pop star’s family was revealed in the High Court yesterday when Dolores O’Riordan’s former nanny began a case for false imprisonment and breach of contract against the Cranberries’ singer and her husband Donald Burton. Joy Fahy is also seeking the return of personal belongings from Dolores and Donald Burton which she claims they are holding. She wants the equivalent of IR£10,000 a Cherokee Jeep and a deposit for an apartment, all of which she says she is owed. Dolores and her husband were in the court to hear tales of lavish lifestyles, neglected horses, rejected jeeps and ejected designer clothing. Ms Fahy (34), from Batterstown, Co Meath, said problems arose from the start, when she joined the Burtons on a verbal contract. The nanny, who previously worked for Larry Mullen from U2, said Mr Burton had promised her the “sun, moon and the stars”, and had pledged to beat any salary she was already on. She was asked to begin work by flying out to the Four Seasons Hotel in Los Angeles in May 1999, during a tour by the Cranberries. She then moved with the couple’s 18-month-old child, referred to in court as Baby T, to Trump Towers in New York. Disputes over hotel bills followed, as well as over her salary, the second hand jeep givento Ms Fahy, her days o , the short notice given to her of travel plans and the care of her horse. The childminder was not given a mobile phone, and said Mr Burton frequently tried to get her to drink alcohol with him. Ms Fahy claimed that when she returned to Ireland, she was unable to collect her belongings. Some were returned in black bin bags, she said, and many were damaged or destroyed. According to articles published this weekend by the Irish tabloids The Mirror (Saturday) and the Sunday Independent (Sunday), The Cranberries lost a whopping €1.3 million of their own funds during the year 2002. This information comes from the recently-filed financial reports for their self- owned company, Curtain Call Limited. The filed accounts show that Curtain Call began the year with a surplus budget of €647,500 and ended with a deficit of €673,500. Directors’ fees for the year were €12,000 and €818,431 was paid for what’s denoted as “other services.” Perhaps the most costly expense was the €1.2 million in taxes that hit the company for the year. The Sunday Independent is quick to point out that despite the harsh year, The Cranberries still have plenty to fall back on; the band is estimated to be worth around €50 million. This news compares with an article published last year by The Sunday Tribune which shows hefty touring costs cutting into the band’s profit in 2000 and 2001. The Sunday Independent tried to call the Curtain Call offices for comment on the 2002 loss but received no response. As you might have guessed, announcements of Dolores O’Riordan solo performances have been popping up since her first solo appearance at Sanremo last weekend. Today, the o cial Zucchero newsletter confirms that she will appear at a Zucchero album launch charity concert at the Royal Albert Hall on May 6th. Also, the newsletter confirmed that Zucchero’s duets album, tentatively titled “Made of Stars,” will be out on May 14th. Last year, Dolores recorded a duet of Zucchero’s song “Puro Amore” which will appear on the album. From the Zucchero newsletter: “Zucchero has announced details of a unique one-night concert event at the Royal Albert Hall on Thursday 6th May 2004. The Royal Albert Hall show will celebrate the release of Zucchero’s new album with many guest stars, Italian and international, which again shows that Zucchero’s music has no boundaries. This unique concert is a benefit in aid of the United Nations UNHCR Refugee Fund. It is therefore appropriate that it will reunite Zucchero with many guests that feature on the new album that will be realeased on May 14th. Artists so far confirmed to appear include, Solomon Burke, Ronan Keating, Cheb Mami, Brian May, Mousse T, Luciano Pavarotti , Dolores O’Riordan of the Cranberries, Paul Young and more will be added to this very special evening. Tickets are available from BookingsDirect.com. 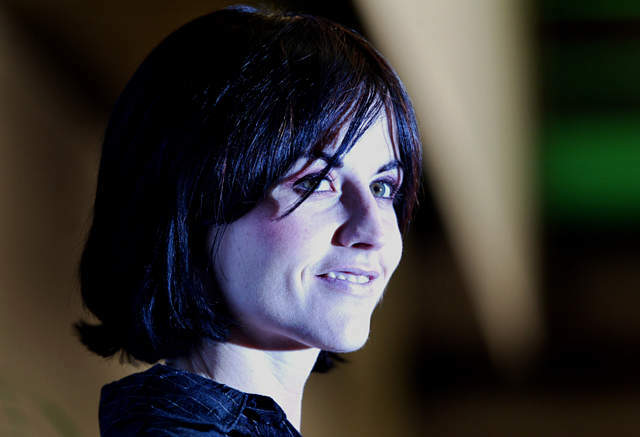 Virgilio Musica has published a near-complete transcript of Dolores O’Riordan’s press conference at the Sanremo Festival last Friday. 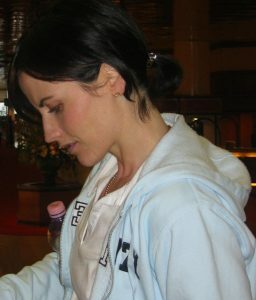 Several Italian press outlets have noted some of Dolores’s contradictions during the press conference — at one point, she says there will not be another Cranberries album, yet at the end of the conference muses that the band may regroup in the future. Here is the transcript. Thanks to forevercran for help with the translation. You played “Ave Maria” some years ago at Pavarotti and Friends, didn’t you? What do you think about The Passion [of the Christ]? Who asked you to collaborate on it? Dolores O’Riordan: [It was] during the production of the movie, and I said yes immediately and willingly. I like the subject very much, it’s a real true film even though the risk of talking about religion is very high. Dolores O’Riordan: No, becouse in Toronto, where I now live, tickets sold out in a very short time. I wasn’t even sure that my “Ave Maria” was on the soundtrack but than I recived a call from a person in the record industry that said the song is on it. How do you judge yourself as a musician? Dolores O’Riordan:I always follow my spiritual evolution, but musically I haven’t changed a lot. I play with the piano to get some inspiration and then I decide to join in with the other instruments. Do you write always in Limerick, sorrounded by the country? Dolores O’Riordan: No, now I live in Canada, as I have just said… but the relationship with the country hasn’t changed. I couldn’t live in the city. I like to walk on the nature and to see some wolves or bears. One time a deer came to me to say hallo… it was a great experience! Dolores O’Riordan: Yes I think I will relase a solo album in 2005. Or maybe 2006 at the latest. It’s because of my children. I want to spend all my time with them. One is 7 years old, I can’t leave him alone as I travel around the world, not even for a few weeks. Sorry, and the new Cranberries album? Dolores O’Riordan: What new album? I don’t think we’ll be putting out another disc as The Cranberries. We were together 13 years and now our position in the music industry doesn’t make sense… even if our relationship is still good. You are explaining a decision that will distress thousand and thousands of fans all over the world, did you think enough about that? Dolores O’Riordan: Come on! It wasn’t a fatal attraction; It was just a group… the problem was that it wasn’t exciting anymore, it was just a routine. To be honest the lads wasn’t very happy when I told them the decision of leaving the band to go overseas. But than they pondered and now they are happy this way. What a pity. Now just U2 remain to represent Ireland in the music world. Dolores O’Riordan: The Cranberries have never been U2 and I wanted to get away, not to be tied to a group for my whole life and have a lot of regrets until the day I die. Are you afraid about the industry exploitation at this point? A live album after the band split up, a B-sides CD, the usual routine? Dolores O’Riordan: I don’t think so, just because it’s not a definitive break up. It isn’t out of the question that sooner or later we’ll be back together. I mean, life is a journey and sooner or later we all meet back on the same road, no? 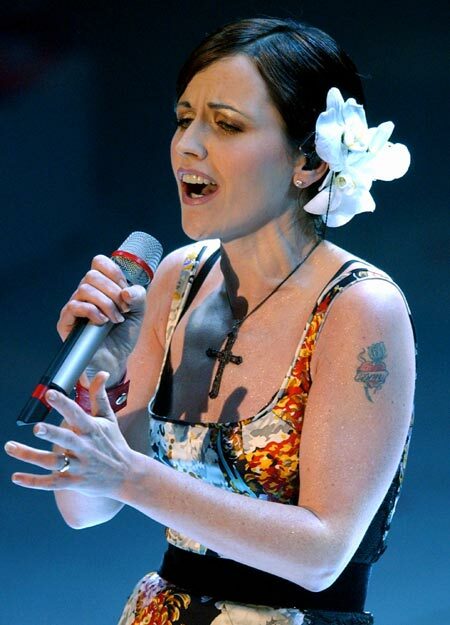 More media is coming in from Dolores O’Riordan’s first solo performance yesterday at the Sanremo Festival 2004. The first three photos below are from Reuters. The first is taken from Friday’s press conference, while the next two were taken during her performance on stage late last night (1:00 local time). Photo 4 is from Corriere della Sera (thanks Little_Dolores). The last photo is from Virgilio Musica, and appears to be taken at the same time as the photo from Corriere della Sera but at a different angle. If you have found more news or photos from the Sanremo festival, please send them to us! In a press conference in Sanremo, Italy, today at 17:30 local time, singer Dolores O’Riordan confirmed that The Cranberries have split for the foreseeable future. Below is a photo of Dolores from the press conference, her first public appearance in months and Dolores’s first press conference since the day of September 17th, 2003. 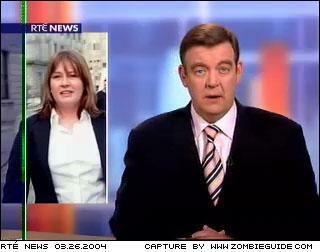 Zombieguide will have more news on Dolores’s appearance at Sanremo 2004 as Saturday approaches. Thanks to many, many people for help with this important news piece. The March issue of the Italian magazine “Tutto Musica” carries two articles about The Cranberries, though neither carry any new information. QUESTION: I’m a big Cranberries fan and I’m looking forward to hearing their next album. Do you know anything about? ANSWER: From what we can see on the official website of Dolores O’Riordan’s band, the band is working on several projects, but no mention of a new recording. Most likely Dolores will release a solo work (perhaps a soundtrack, expected for this spring [Songs Inspired By The Passion of the Christ]) and so will Noel Hogan. The Cranberries have anyway denied about their breaking-up. To check out scans of the new issue of Tutto, head over to the Magazines Gallery. Thanks to Eva and Lorenzo for the scans and info.